52 mins "Undeniable" Shale Slowdown? 40 mins How many drilling sites are left in the Permian? Is The Japan LNG Buying Spree Over? Natural gas prices shot through the roof on Wednesday as weather forecasts called for an increasingly cold winter in what is looking like a tightly supplied market. 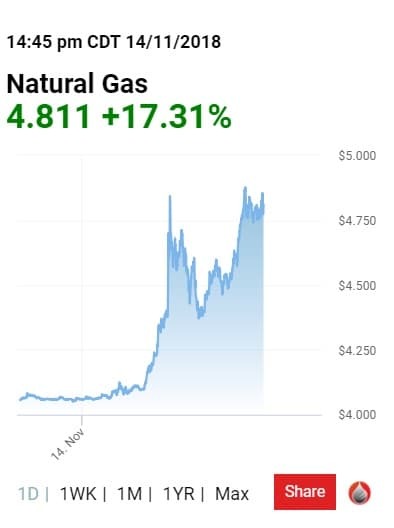 Natural gas spot prices had climbed by more than 10 percent shortly after 11:00am EST, to reach $4.512—a price that traders haven’t seen since Fall 2014. The natural gas futures market had an exceptionally volatile trading morning, with prices surging about 35 percent since the beginning of the month, likely stemming from traders rushing to cover short positions as panic set in. The 10- to 15-day weather forecast that has the market in a jumble calls for exceptionally cold weather over the next six to fifteen days—the trend showing ever increasing cold temperatures. The panic was not limited to traders covering their shorts—Jacob Meisel, chief weather analyst at Bespoke Weather Services claimed that prices could reach $7-$8 MMBtu if December and January were really cold. “if cold weather really takes off, the skies the limit,” Meisel said of the natural gas price moves. The cold snap is just one factor pushing prices upward. Inventories for natural gas are also low for this time of year, data from the EIA showed last week. Total natural gas stocks as of 11/02 were 3,208 Bcf—a 15.3% decline from this week a year ago, and 16.2% below the five-year average. Updated storage data is scheduled to be released Thursday, November 15, 2018. Just yesterday, the International Energy Agency said in its latest World Energy Outlook that there were no more worries about a glut for natural gas, thanks to China’s healthy appetite for the “bridge fuel” in its efforts to curb pollution. China recently overtook Japan as the biggest natural gas importer in the world. By 2:30 PM ET, Henry Hub natural gas traded more than 17% higher on the day. As usual, the entire focus is on PRICE & market dynamics without looking at the underlying challenges. Gas storage may be down, but potential shortages & supply curtailments in places like New York State in a protracted "cold snap" will largely be tied to transportation. 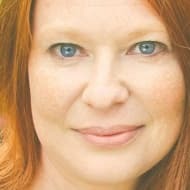 Some energy observers have been conscious that take away capacity was not keeping up with increased production in the Marcellus & Utica with several major pipeline projects sidelined. Those pipelines would be Constitution, Mariner East, among others. So, if the northeast markets (especially NY) end up in a "pinch" this winter, then place any BLAME where it rightly belongs...with short-sighted government officials & environmental activists groups...NOT your energy PROVIDERS! I would think that with falling oil prices it too would cut natural gas production as a byproduct of oil drilling, much of what is used as a figure to lower natural gas prices.